What’s better than Mtn Dew, Sierra Mist, or Pepsi? Three new products from each brand’s portfolio, just in time for your springtime shelves. We see big things in these beverages’ futures! The Dew Nation is adventurous, passionate, and all-out awesome. Mtn Dew Black Label is testament to that. A deeper, darker Dew featuring dark berry flavors, herbal bitters, and crafted with real sugar, this soda is an experience just as fans of the brand have come to expect. Focused on the cross-cultural male millennial target, Mtn Dew Black Label is made for those upscale moments that the Do The DEW mindset offers fans. Mtn Dew was originally released in 1954, and the brand has continued to meet the demand of its loyal fans for decades. 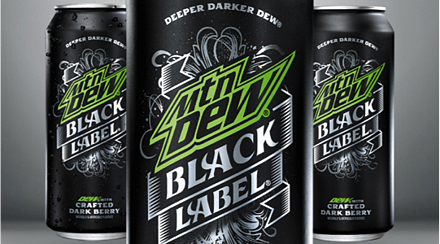 Mtn Dew Black Label, which will be packaged in a sleek, 16 ounce black matte can, is just further innovation from a product that continues to boldly refine taste and the soda industry. 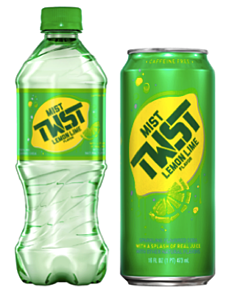 PepsiCo has put a new twist on lemon and lime: goodbye Sierra Mist, hello Mist TWST. The crisp, citrus soda has a splash of real fruit juice and is caffeine free. The beverage combines the best of the drinking world: soda, juice, and water and delivers a delightfully refreshing lemon and lime taste that is just right. At only 100 calories per eight ounces, Mist TWST is the perfect combination of refreshing soda, the taste and flavor of real fruit juice, and the replenishing qualities of water. Mist TWST also comes in two other varieties – Mist TWST Diet and Mist TWST Cherry Lime, both of which will hit shelves in April. Also coming out later this year, Mist TWST Cranberry Lemon Lime. The cult-like following of Mist TWST Cranberry Lemon Lime’s predecessor, Sierra Mist Cranberry Splash, should find plenty of new support and fans in the brand’s reboot. The brand Pepsi-Cola originated in 1898, but five years prior to that in 1893, an American pharmacist named Caleb Bradham debuted a cola called Brad’s Drink, which became the soda we love today – Pepsi-Cola. Paying homage to its rich cola heritage, PepsiCo has unveiled two delicious new colas. 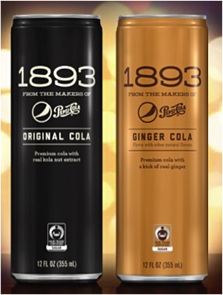 1893 is available in two varieties, Original Cola and Ginger Cola. The original recipes Bradham concocted nearly 125 years ago inspired this new line of beverages. 1893 is made with premium kola nut extract, fair trade sugar, and sparkling water. The addition of a custom blend of herbal and botanical extracts, bitters, and brown malt provides ingredient authenticity and social responsibility promoting credibility to a new cola platform. Cola fans will have plenty to celebrate and savor with each sleek, 12-ounce can they enjoy. New products are just the tip of the iceberg when it comes to what Bernick’s offers our customers and communities. We’re proud to serve both as we have for 100 years. Make sure you ask your Bernick’s rep about Mtn Dew Black Label, Mist TWST, and 1893 the next time you see them in your store or business.